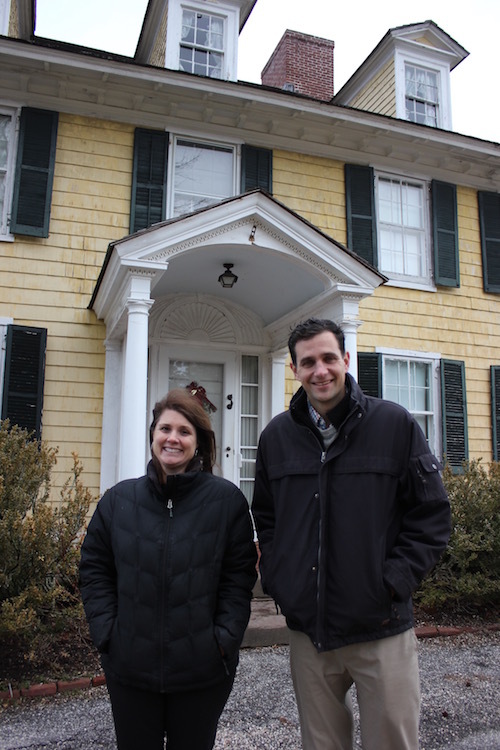 Two new leaders have taken the helm at Sylvester Manor Educational Farm on Shelter Island, with plans to guide the farm through the next phase of its development. Stephen Searl, who had worked as a land conservation manager for the Peconic Land Trust during the initial phases of the conservation of the farm, has taken over from Jo-Ann Robatti as Executive Director. Tracy McCarthy, a Shelter Islander, is moving from a family business in magazine publishing to take on the newly created position of Director of Operations at the farm. The 83-acre farm is currently closed up for the winter, while the core staff of 10 is working in one of the residences at Camp Quinipet, making plans for the spring, when the staff swells to about 20 people for the summer season. Mr. Searl and Ms. McCarthy agreed to meet in the winterized Manor House on a cold day in early February to discuss their plans. “It’s the perfect fit for me, because of my background in farming,” said Mr. Searl, who grew up working on his family’s Wickham’s Fruit Farm in Cutchogue. Mr. Searl, who lives in Mattituck, had been commuting for the past three-and-a-half years to work at the North Shore Land Alliance in Oyster Bay. Ms. McCarthy is also leaving a monster commute behind — she had previously been commuting to Connecticut from Shelter Island two days per week. Sylvester Manor Educational Farm hosts several apprentice farmers and Worldwide Workers on Organic Farms (known as wwoofers), who live in the Manor House and work in the fields each summer, organizing agricultural educational events for adults and students, for agricultural professionals and novices, each year. The farm also hosts a series of roots music events throughout the season, and is developing exhibitions about the property’s history. Bennett Konesni of Belfast, Maine, was put in charge of Sylvester Manor, his family’s estate in 2006, when he was just 23 years old. It had been inherited by his uncle, Eben Ostby, a founding partner in Pixar Animation Studios, who lived in California and didn’t have the time to take care of the property. Mr. Konesni, who had worked at PLT’s Quail Hill Farm in Amagansett, and had started an organic farm while in college in Vermont, worked with the Peconic Land Trust and the town of Shelter Island to conserve the property and turn it into a non-profit educational farm. “That enthusiasm and vision rubs off on all of us that work here,” said Ms. McCarthy. Their goal for this year is to keep up high quality programming at the farm, and work on a strategic long-term plan for the property. The property, which was overgrown and run-down when the non-profit was formed in 2009, is still being returned to active use. Last year, the farm installed an innovative wastewater treatment program, using a constructed wetlands to filter wastewater, with showering, laundry and cooking facilities for the farm staff. The project was designed to take the burden off the aging septic system at the Manor House. But the summer farming staff still lives in the Manor House, and long-term plans include finding another suitable space on the property for farm workers. 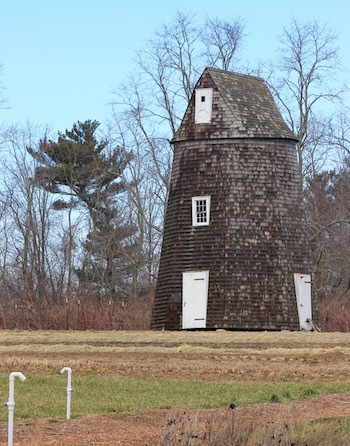 The farm is currently renovating a historic windmill that stands at the edge of Windmill Field, where much of the vegetable farming on the property is currently done. It’s part of a goal to connect the history of the property with the present. Mr. Searl said they hope to make the windmill mechanically functional again. About 60 acres of the property are rented as cow pasture to Acabonac Farms, and Mr. Searl said there may be a future for more livestock farming at the property. En route to the Manor House, on a hill above the main driveway, is an overgrown cemetery encircled by a low wood picket fence. This is where the slaves who had worked at the manor are buried, though you wouldn’t know it but for a newly installed sign. Telling the narrative of the slaves who had worked at the manor will also be a priority in the long range plan. Formal gardens surrounding the Manor House also require work, and Ms. McCarthy said a fruit orchard could also be restored.